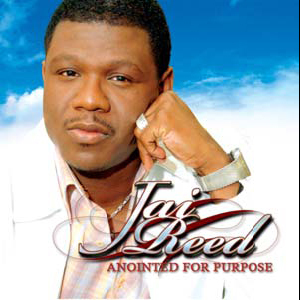 JAI REED ?Anointed For Purpose? ? Copyright 2008 by Dr. Velma Smith. All rights reserved. Jai Reed emerges as a dynamic component for the 21st century gospel scene. He is a vibrant powerhouse with an extremely impressive and resilient creative edge. He is dynamic, gifted and an exceptionally talented gospel ?heavy hitter? who possesses a glorious anointing for such a time as this! This young man is certainly destined for much success in the gospel music industry. In fact, God has tremendously magnified his vocal capabilities.
? Copyright 2008 by Dr. Velma Smith. All rights reserved. Jai Reed emerges as a dynamic component for the 21st century gospel scene. He is a vibrant powerhouse with an extremely impressive and resilient creative edge. He is dynamic, gifted and an exceptionally talented gospel ?heavy hitter? who possesses a glorious anointing for such a time as this! This young man is certainly destined for much success in the gospel music industry. In fact, God has tremendously magnified his vocal capabilities. Please meet and hear Jai Reed in his humble, yet, finest hour as he presents his current CD, entitled ?Anointed For Purpose.? His exceptional vocal talent on this project takes melody and harmony in a completely new direction. This project is an authentic masterpiece communicating a noble and majestic distinction with a refreshing style. Amazingly, his vocal qualities encompass an exceptional abundance of inspiration and rhythmic directness with a caliber that is profound. Relax Jai's creativity and labor-intensive versatility in each song offers something for everyone. This project is a must have? for your gospel collection. Jai's roots and compelling musical heritage are grounded in the rich and distinct musical culture of the ?Big Easy? New Orleans. Singing is not foreign to Jai, actually, he started singing for friends, family and local church groups at the developmental age of six. As a teenager, Jai became a member of the group Endurance; along with group members William Maxwell, Bryon Pierce (Men of Standard), Edward West (Collage) and the late Michael Robinson. This is the group which launched Jai's professional music career. Currently, Jai holds the elite recognition of being nominated for the 24th Annual Stellar Awards as; Male Vocalist of the Year! He was also blessed to give an outstanding performance for Dr. Bobby Jones' 70th birthday celebration. A quick glance at Jai's repertoire of performances is quite impressive. He has toured with two outstanding stage plays (Michael Matthew's production of ?Mama I'm Sorry? and Tyler Perry's ?I Know I've Been Changed?). He has shared the stage with legendary artists such as Shirley Murdock (?A Woman's Point Of View? and ?Let There Be Love,? Electra Records), Melba Moore (?Lean On Me? and ?Lift Every Voice and Sing? ), David Preston (?Two Wrongs Don't Make It Right,? ?Don't Say No? and ?Can I?? Geffen Records), Mixed Emotions (including Luxury of Love, MCA) and many others. the House of Blues Gospel Tribute, New Orleans Jazz and Heritage Festival, and recently in The Essence Festival in New Orleans. Jai blessed the masses in 2000 with his debut solo project ?I Can't Repay.? This project was absolutely anointed and the blessings were bountiful to his fans and multiple listeners throughout the United States and abroad. Most notable, however, is his ministry objective for the gospel community through the ?ministry of song.? ?Anointed for Purpose? immediately establishes a dialogue with the melody and the lyrics and diffuses this quality throughout. Such profoundness affirms an uplifting and liberating factor to the listening ear. Jai's unique stylistic diversity on this project simply raises the bar of excellence. He graciously mesmerizes his audience with every song on the project. Like King David, Jai has been anointed for purpose. Richly blessed by God with tremendous vocal talent, he effortlessly sings with a personalized melodic/harmonic blend. Jai's spectacular vast reservoir of vocal techniques and his ability to execute them is nothing short of prolific.? This exceptional project offers authentic, powerful and spiritually charged tracks such as ?Anointed Me,? ?Have I Told You,? and an all-time gospel favorite ?He Touched Me.? ?Anointed for Purpose? is a musical story which prepares the listener for an authentic worship experience, that ends well yet, forever memorable! It is a smorgasbord of gospel music at its best and conveys a uniqueness of its own. You can find Jai working in the vineyard in his own ministry which includes hosting a nationally known annual conference, Praise, Worship and the Word.? Jai Reed graciously invites you to authorize the lyrics of this powerfully anointed project, ?Anointed For Purpose,? to bless and ignite the sparks of your spirit. Turn your radio on and enjoy Jai's anointing -- you will soon understand that he is ?Anointed For Purpose.? Remember, the anointing destroys the yoke. You will be glad you did!